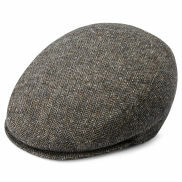 Flat caps, also known as ivy caps, not to mention the similar newsboy caps, have been around for a very long time. It's only recently that they've made a serious comeback on the men's fashion scene, though. Most of our flat caps and newsboy caps are available in two sizes and several different designs. In its basic form, the body of the cap is pulled forward over the brim and is sewn or snapped to the top edge of the brim. Flat caps are recognizable by their triangular profile.